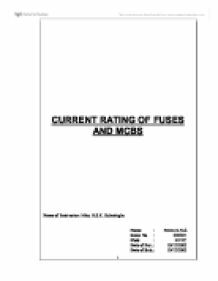 Current rating of fuses and MCB's. These have a thin wire that is held on a ceramic holder. The wire is designed to burn when a high current passes. An advantage is the reusability but it is vulnerable to mishandling where incorrect fusing elements can be fitted by inexperienced people, putting users in danger. Other Problems with this type are the oxidization (causes the cross section of the wire to reduce reducing the current carrying capacity) and longer fusing time. Fuse wire is enclosed in an inert environment. Once burnt, the fuse has to be replaced i.e. a repetitive cost when replacing. These are used for high current protection. These have a ceramic outer barrel. The fuse wire is covered with sand in order to quench the arc produced when the fuse burns. The ceramic barrel can withstand the shock of the interruption of the high current. Usually semi-enclosed rewireable fuses have about 1.7-2 times the rated current carrying capacity. In this practical the fusing factor was . This value is rather high. However the value might not be the exact fusing factor of the fuse used due to the errors that are present in the practical. Rewireable fuses tend to weaken with time due to oxidization. 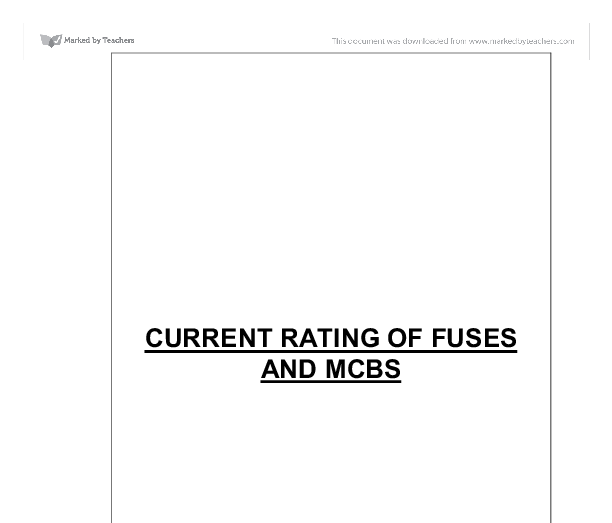 So the fuse will not be able to withstand the rated current. Large Current Protection - Here simply breaking the circuit is not enough to stop the flow of current. The current in some circuits is strong enough to jump, or arc, across the gap in the circuit, even after the circuit breaker has been tripped. Circuit breakers that deal with high levels of current, especially direct current, have methods of getting rid of the energy in the arc and stopping the current. In oil breakers, the design of the circuit breaker forces the arc of broken circuit through a sealed container of oil or gas. The arc heats the oil around it. The hot oil begins to circulate in the tank, carrying heat and energy away from the arc. Air-blast circuit breakers send the arc through compressed air, which is immediately released to the outside, carrying the heat and energy of the arc with it. Fuses used in vehicles and motors - Some of these fuses are Ribbon type, Knife blade cartridge type, Plug type with ribbon tube, Copper fuse link, Fibre tube, Cartridge type with glass tube and wire fuse link. Sensitive Equipment - Fuses used in 13A plug tops as well as in some sensitive equipment for additional protection (voltage stabilizers, computer power supplies) – These are mostly cartridge type fuses. Thermistor From my results, for the thermistor experiments, I can see that when voltage increases, current increases too, but not proportionally. When voltage doubles, current doesn't double, it more than doubles. Voltage Range (volts) Current Range (mA) Gradient 0.1-0.2 9.9-17.8 0.079 0.3-0.4 26.0-35.8 0.098 0.5-0.6 44.9-55.1 0.102 0.7-0.8 67.2-80.1 0.129 0.9-1.0 93.8-107.9 0.141 At a higher current, resistance decreases. The others that do not obey Ohm's Law are called Non Ohmic Conductors. Conductors such as pure metals are ohmic conductors. In this case the ohmic conductors have to be kept under constant pressure and constant temperature for them to behave as ohmic conductors. This was measured using the ammeter and controlled using the variable resistor. The amount of nails lifted was the outcome measure we recorded using the panel pins and the balance. The current was varied to 0.1, 0.3, 0.5, 0.7, 0.9, 1.1, and 1.3 amps and the weight of panel pins lifted at each current was recorded. Determining a maximum and minimum diameter for the wire I decided to use the maximum and minimum values of wire that were available. These were 14SWG and 32SWG. I decided to use all of the available thicknesses as it would give me a more accurate set result. The high pressure produced by the explosions cause the cavity to expand to its maximum and then it would collapse. It results in a rubble chimney. Depending on the strength of the explosion, the chimney could reach up to the surface and a crater would form.